An assembly is a single deployable unit that contains all the information about the implementation of classes, structures and interfaces. An assembly stores all the information about itself. This information is called metadata and includes the name and version number of the assembly, security information, information about the dependencies, and a list of the files that constitute the assembly. It is the assembly manifest. All the applications developed using the .NET Framework are also made up of assemblies. Namespaces are also stored in assemblies. Assemblies and the metadata provide the CLR with the information required for executing an application. For example, if an application uses a component, the assembly keeps track of the version number of the component used in the application. The assembly provides this information to the CLR while the application is being executed. Assemblies also play an important role in deployment and versioning. Assembly can comprise of one or more than one code files, which can be in any programming language. But Visual Studio doesn't permit this, it permits only one code file. An assembly file has an extension of .dll or .exe. an application in the .NET framework consists of one or more assemblies. Manifest: It contains metadata information such as name, version, culture referenced assemblies and security requirements. MSIL: It is Microsoft Intermediate Language Code. It gets generated when you compile an application by using the .NET compiler. Required Resources: These include the resource files for the application. Every application has its own assembly unlike the DLL which was used before the advent of assemblies. DLL was used to share libraries of code. You must have to register to a DLL if it is not developed by you. Whereas in ASP.NET, the assembly is automatically created. There are several ways to group the various elements in an assembly. You can group all elements (manifest, MSIL and resources) in a single physical file or group them separately in several files. An assembly that groups all elements in a single file is called a single file assembly, whereas the assembly that groups its elements in multiple files is called a multi-file assembly. A single-file assembly can be created by compiling the application in Visual Studio .NET. The Visual Studio .NET IDE for Visual Basic can only be used to create single-file assemblies. Multifile assemblies can be created using command-line compilers. Private assemblies are those assemblies that are accessible only to the applications residing in the same directory as that of the assembly. When you create an assembly, it is private by default. No other application can make use of private assembly. For a private assembly to be accessible by more than one application, you must copy the files of the assembly separately into the folder in which the other application resides. Shared assemblies are assemblies added to the GAC (Global Assembly cache). GAC is used to store assemblies and to share them between multiple applications. IN the shared system, the names of the assemblies should be unique as it can be accessed by all applications. The newer versions of the component should also have unique names. These can be achieved by using a strong name for the assembly. A shared assembly is placed in the GAC folder that is reserved for shared assemblies. Note: Sharing an assembly and installing it to the GAC requires your assembly to be signed with a strong name. A strong name uniquely identifies an assembly. It conatins information about the assembly, such as its name, version number, culture information (if any), and the public key of a public/private key pair. Open your project in Visual Studio .NET. In the solution explorer, open the AssemblyInfo for your project. In Visual Studio .NET Solution Explorer, right-click the References node. Select Add Reference. The Add Reference dialog box appears. Click the Browse button to locate the assembly. Check the references node in the Solution Explorer to verify that the reference to the assembly has been added. In all the source files that require access to the assembly, include an Imports statement for the namespace of the strong-named assembly. GAC is a machine wide code cache that is used to store assemblies that are created to be shared by multiple applications. You need to assign a strong name to the assemblies before adding it to the GAC. Using the windows drag and drop feature. By adding assemblies into the GAC, it is possible to share the assembly across any application that requires the assembly. In addition, the assemblies are secured against unauthorized access because the assemblies that are added in the GAC can be deleted only by persons having the required rights. Moreover, it is also possible to store multiple copies of the same assembly with different version numbers in the GAC. /l: Used to list the assemblies in GAC. /i: Used to register the assembly to the GAC. Major: This gets changed while adding a new class or a new project. Minor: This gets changed when a module or function is added to the project. Build: This number gets automatically incremented whenever the component is built. Revision: This gets changed during bug fixes or patches. The major and minor version numbers, the build number, and the revision number together will help to identify the latest version of the component. The version information of an assembly is stored in the identity section of the manifest. You use this section to uniquely identify the assembly. 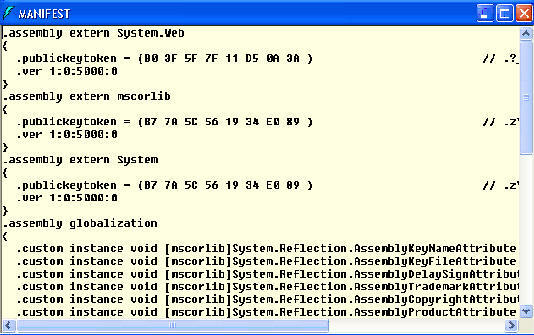 To view the contents of the manifest for a particular assembly, you can use the ILDisassembler (ILdasm.exe). ILdasm.exe is part of the .NET framework SDK. You need to know that assembly can be easily decompiled. You can do that with some of many free .Net decompilers. On that way, if your users have access to your binary files (exe or dlls), they also have access to your source code. At Bean Software, we chose Spices.Net to protect all assemblies (applications and custom controls). Even if you can't afford complete Suite, it is recommended to get at least their Obfuscator for security reasons.